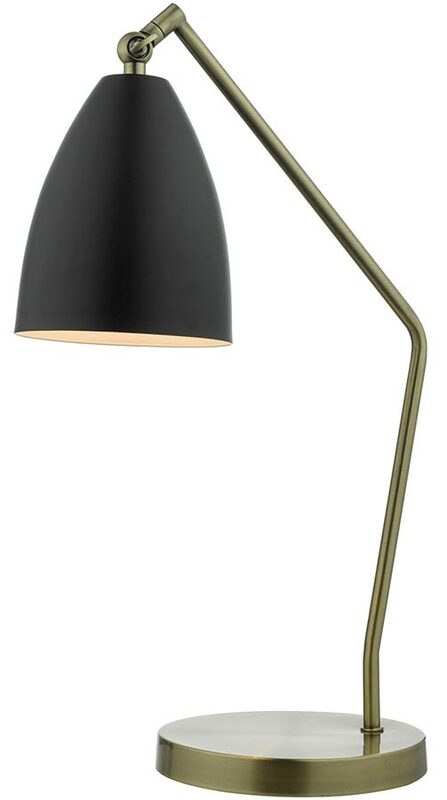 This Dar Olly, black shade, retro style antique brass finish table lamp has mid-20th century influences and features a circular base, angled stem and locking shade thumb screw. The base and stem are finished in antique brass and complement the adjustable matt black shade perfectly. This lovely retro style design can be used in the home office as a desk lamp or as a reading lamp next to your favourite chair. A class 2 double insulated table lamp, no earth required and fitted with an inline rocker switch. Dar lighting is widely recognised as one of the leading suppliers of a full range of innovative, quality lighting products such as the Dar Olly retro style table lamp you see here. A desk lamp can be as decorative as it is utilitarian and we’ve a wide selection of desk lamps that would look equally at home on your desk as well as your side board.